Design a cozy corner with abstract art hanging above a comfortable armchair. Find a side table and lamp to complete the perfect sitting place and take a break with your favorite book. Give your home office a design makeover too with abstract paintings. Organize and streamline the area then hang a colorful modern abstract above your desk. All the colors and textures in the painting will make it easier to sit down and complete whatever task you have at hand. If you’re not getting enough light in the area, then add extra lamps. A tip to buying the right abstract wall hanging for the area you’re designing is measure the space where you would like the canvas to hang, then tape newsprint to the wall and block out the space. Now you know the maximum size of the wall art you want to buy. 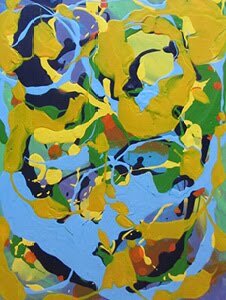 Next when shopping for abstracts ask yourself, do you prefer bold colors, contrast of light with dark, textures, or all of the above? When you’ve selected a few favorites decide which abstract painting is more stimulating to you and buy that one. 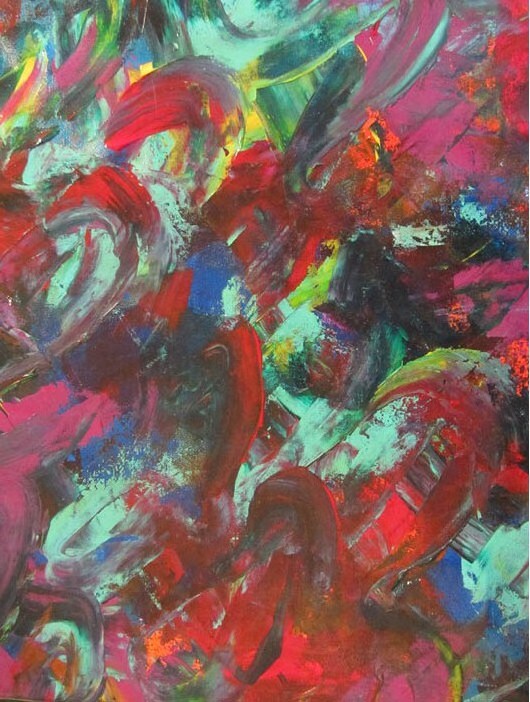 The abstract painting Roller Coaster shown above is a painted in mostly red, green, blue and pink, with bits of orange and yellow peaking through. Brilliant colors combine to capture that thrilling feeling you get as the roller coaster picks up speed then quickly drops from the sky. Original wall hanging measures 18" x 24". 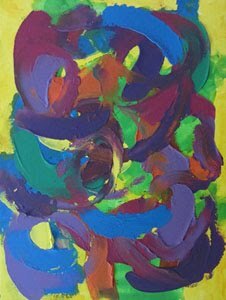 I make abstract painting a priority and never let too much time pass between painting days in my art studio. 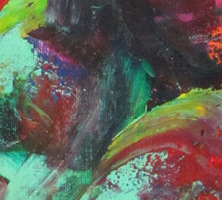 The worst is not having any new colorful abstracts to show when people ask what original paintings I’m working on. I like being spontaneous and I paint whenever the mood strikes. 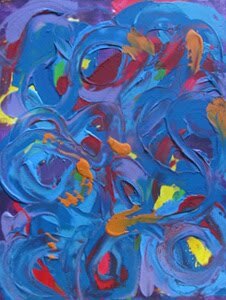 I may have many other things to do, like running my business, but I always have time for painting modern abstracts. I find that other things can wait a day or two and my world doesn’t end! Because I honor my creative spirit first, ideas come to me quickly and I don’t spend long hours looking off into space. My mind is prepared to go to that creative place right away, so I sit down and just start painting my one-of-a-kind art. As I focus on the canvas in front of me amazing things start to happen and images revealing themselves with ease. 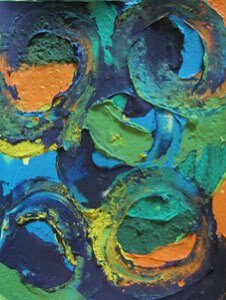 The abstract painting Looking Through Stained Glass shown above is a textured acrylic with boldly applied swirls of paint in striking red, blue, green and orange on a yellow background. The sun illuminates a painted window, and it’s the brilliant colors that capture our attention first. This original wall hanging measures 18" x 24". 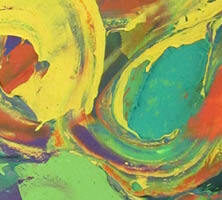 I enjoy abstract painting immensely. 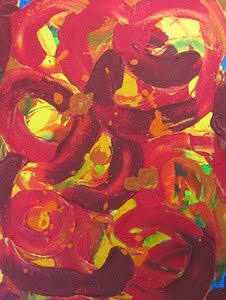 The creative process of painting abstracts brings me to life and makes me feel happy. 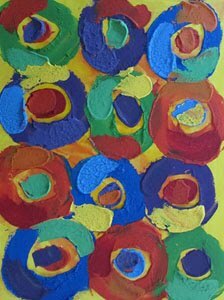 I usually paint modern abstracts in bright bold textured colors. 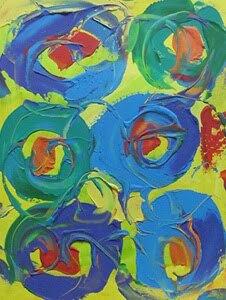 I can be fearless with bold color on canvas, it’s only neutral tones that confound me. 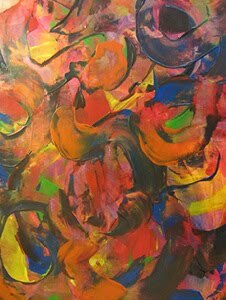 I like splattering and splashing colors on canvas. 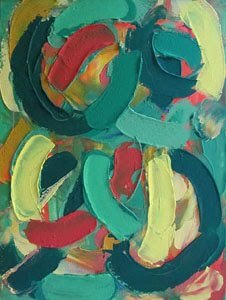 It’s also freeing to use a big spatula to create broad strokes, organic circles and swirls, or any shape I find pleasing, straight lines just won’t do. 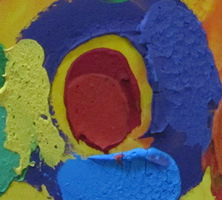 Next I love making paintings with thick textured paint, it’s like frosting a cake. To make this thick paint I add flour. I can create 3 dimensional paintings that literally come out from the wall this way. In some of my contemporary paintings I stick buttons randomly in the thickened colors to create mixed media art. 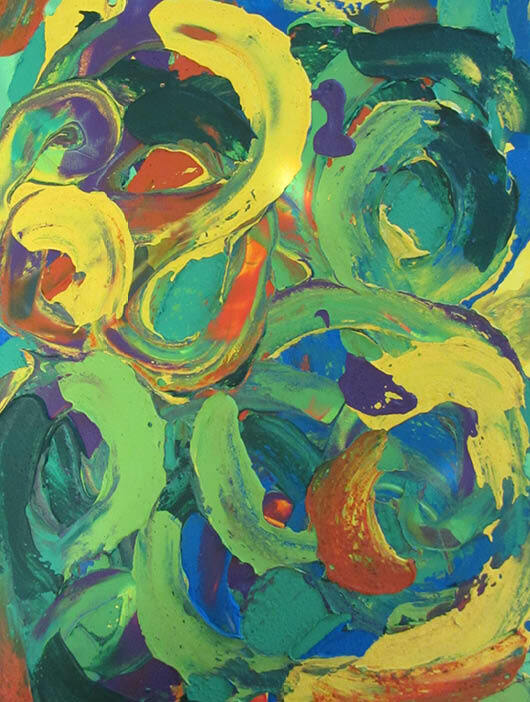 The abstract painting Sleeping Cat shown above is a textured acrylic with boldly applied swirls of paint in striking green, blue with yellow, orange and purple. This striped tabby knows where it’s most comfortable and snoozes on the arm of an armchair. This original wall hanging measures 18" x 24".